These Chicken Pad Thai Zoodles have so much flavor. This dinner is lower carb thanks to all the veggies like zucchini, carrots, bean sprouts, and cabbage. Grab the chopsticks and get this on your dinner table fast! Season chicken with freshly ground pepper. Heat olive oil in large non stick saute pan or wok, over medium high heat and cook chicken breast until fully cooked and juices run clear. Remove chicken from pan and set aside. Allow to rest for 5 minutes and slice. In small bowl, whisk together, honey, chili garlic sauce, rice vinegar, soy sauce, peanut butter, and water to make sauce. Add zucchini, carrots, pre cooked rice noodles and sliced chicken to the pan and pour sauce over top and toss to coat. Toss in bean sprouts and cabbage. 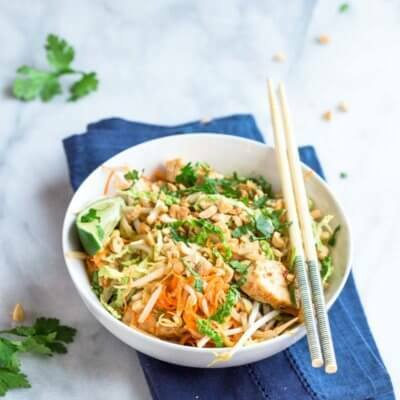 Serve bowl of chicken pad thai with lime wedge, crushed peanuts, and cilantro.